So for those of you that might not be aware, there is a new kid in town for the promotion and sale of the handmade.....it is called 1000markets, and is an absolutely lovely and completely professional venue. It raises the bar on the handcrafted artisan movement towards a higher level in my opinion, and I cannot wait for it to take off in a bigger way. It just recently came off the beta testing stage and is in pre-launch. Artists ( both craft and fine are welcome) are JURIED in, which is really big for me, and there are not categories that include 'vintage' or 'supplies', which in my mind makes for a very different type of shopping experience. Buyers do not have to open an account to shop.....they are simply taken to amazon payments when they make a purchase. It is completely free to have a shop and list your items, once you are juried in, and payment is only taken by the 1000 markets folks when a sale is made. The site is beautiful, quite easy to navigate, professional ( no little hearts or lovey dovey feedback ratings or forums... or higher rankings from re-listing......its not a popularity contest, its a shopping website!) and you can even list your items as "made to order" so any purchase might not even be EXPECTED to arrive for a few weeks.....a handmade treat worth waiting for! There is still plenty of room to make it personal, as each shop owner has a place to blog and a comment wall a la facebook. Your shop is individually owned but shop owners organize themselves into 'mini markets' such as 'Eco-Friendly' , 'Bejeweled Arcade', ' Paperie' etc and you can belong to multiple communities within communities to promote your work. Better yet, create your OWN market, as a few of my friends have at "Vermont, a Way of Life" market! The folks at Real Simple magazine have already done a nice write up on their blog that you might be interested in checking out. 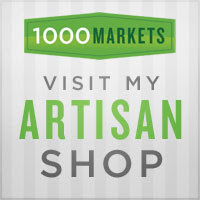 Take a peek at 1000Markets when you have some time....it's such a treat!